1. 2010 and 2011 MacBook Air SSD is 6+12 pin, only one side have contact,size is 109 mm*24 mm. 2. 2012 MacBook Air SSD is 7+17 pin, size is 109 mm*24 mm. 3. 2013 and 2014 MacBook Air SSD is both side have contact,one sid is 16+12 pin,the other side is 11+14 pin,size is 89 mm*24 mm. 1. Please identify interface definition of your SSD. current to the ssd,the computer can't identify or work can't well because the power supply can't meet requirements. 3. Don't to use USB extension and HUB,because it will lead to insufficient power supply. 4. Data lines connected to the computer's USB port after the home for desktop. 5. The SSD work will release heat,the shell fells very hot,this is normal. 6. Mac OS and some digital camera system use disk format can't compatible with Microsoft system,new SSD if there is no partition,open the "my computer"
can't see the ssd, please use the Disk Manager in Windows to delete the partitions or to create a new partition on the SSD. 7. This product performance is being improved unceasingly, like has the change, not separate informs even slightly.Pictures for reference only, subject to our available products. 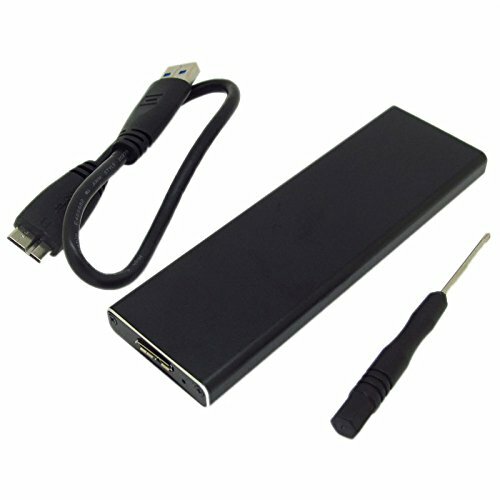 Only support 7+17 PIN 2012 Apple MacBook Air A1465 A1466 MD223 MD224 MD231 M232 SSD to USB 3.0 interface. If you have any questions about this product by Cable & Adapter, contact us by completing and submitting the form below. If you are looking for a specif part number, please include it with your message.